Previously we mentioned about Infocus’s future projector design with DisplayLink, now the innovative display technology has been built into Sony Vaio Docking Station and ready for consumer market. Named as VGP-UPR1, it is compatible with all Sony Vaio laptops as well as other brand laptops that comes with standard USB connectivity. DisplayLink technology is a new way to enable multiple external displays through USB ports. 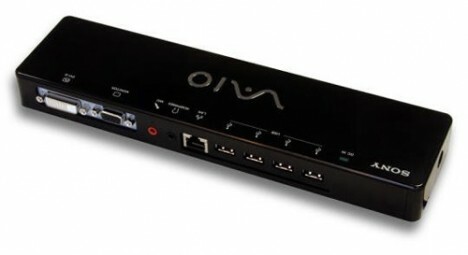 Besides necessary VGA and DVI display ports, the docking station is also enhanced with some standard interfaces such as Ethernet port, earphone, microphone and 4 USB ports. Combining with the advanced graphics processing technology from DisplayLink connected through high bandwidth USB port, it offers a simple but yet powerful solution to office space with a display resolution of up to 1600 X 1200, which is far more sufficient for multimedia applications. The docking station can be used in Windows 2000, XP and even Vista in both 32-bit and 64-bit versions. Priced at $199.99, it is a good buy if you think the existing display ports on your laptop is insufficient. Anyway, the docking station is already available to consumers in United States, Japan and Europe markets.